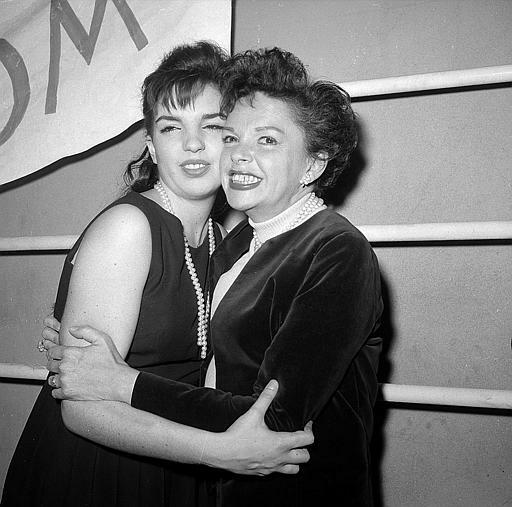 Judy Garland hugs her 17-year-old daughter Liza Minnelli after watching Liza star in the Off-Broadway revival of the 1941 musical "Best Foot Forward" in 1963. Sunday is Mother’s Day, a celebration that has been around in one form or another since the days of the Roman Empire. I wonder if they had mom centric songs back then? So who says that songs about moms must always be cheery and fun loving? That’s certainly not a realistic view of parenthood or life in general. And what better genre to take on a sad song about being a mom than country music? My first pick has that beautiful twangy country sound from the late 1950s. Musicianship played an important role then, and the Carter Family’s mournful melodies still held sway for many artists, including the legendary Kitty Wells. Kitty Wells was country music’s first female superstar. She’s often overshadowed by Patsy Klein, but Wells was the first in many areas of county music: She was the first to record an LP and the only female solo artist between 1953 and 1955 to maintain her success, especially on the charts. Her 1955 hit "Making Believe" is considered one of the greatest songs in country music history. Her voice, with its slight falsetto in a minor key, has a big influence on later vocalists, like Iris DeMint. To have to be her mommy for a day"
This is a timeless song, as I’m sure hundreds of divorced or separated couples can relate to all the emotions involved in child visitation. As I warned: not an upbeat ode to moms or motherhood. My own mom has taken on many roles over the course of mothering, which by the way, NEVER ends. Let’s see, there’s doctor, teacher, comedian, chef and of course, counselor and confidant. Sometimes we need mom there just to hear us out without offering any unsolicited advice or passing judgment. So here you have Sarah Vaughn confessing to Mama about the man she’s taken up with. "Mama He Treats Your Daughter Mean" was first recorded by R&B legend Ruth Brown in 1953, when jazz and blues crossed paths and created jump blues and later R&B. Names wouldn&apos;t come when I was ready to have him. The only name that came to me was Zion. I was like, "Is Zion too much of a weight to carry?" But this little boy, man. I would say he personally delivered me from my emotional and spiritual drought. He just replenished my newness. When he was born, I felt like I was born again. I wanted it to be a revolutionary song about a spiritual movement, and also about my spiritual change, going from one place to another because of my son. Now that is love for a mother’s child. Happy Mother’s Day! Tyrone Davis was a true representative of “Chicago Style” soul music. Before he passed away in 2005, he sold millions of records. He was known for bold outfits and tight leather pants as part of his on-stage persona. He had a huge following of female fans. His working group, known as The Platinum Band, was one of the best in the business, and other artists were always trying to hire them away. They were the ensemble backing up Tyrone on this 1991 record called Mom’s Apple Pie. Davis was referring to how sweet a particular woman was. The ladies loved this song. This extraordinary mother-and-daughter combination takes superstar quality to the max. Actor and singer Judy Garland signed a movie contract with MGM when she was 13. She had already been performing with her sisters from the age of 2 or 3 before a leading role in The Wizard of Oz in 1939 made her a star. Unfortunately, she led a tragic life: addicted to pills, she died in 1969. Daughter Liza Minnelli also started as a young professional at 16. Just three years later, she became the youngest woman to win a Tony as lead actress in a musical. The play was Flora The Red Menace. She’s now 67 and still performing. This duet with mother and daughter was taken from The Judy Garland Show, which aired for one season in the early ‘60s. The career of actor Mr. T had an unusual start. He was a student at Chicago’s Dunbar High School when he won several wrestling championships. Later he became a bodyguard and a celebrity bouncer. For many people who came of age in the mid ‘80s, the name Mr. T automatically takes you back to the television series called The A-Team, in which Mr. T’s unforgettable character was B.A Baracus. It was also during this period that he made this music video called “Treat Your Mother Right.” He was at the height of his popularity, so it wasn’t a stretch for him to try being a rapper. That was hilarious. We also had two guests on Eight Forty Eight today, rockin&apos; music moms who each provided song picks. Kori Gardner is one-half of the couple team Mates of State. For years, she wrote a music blog called "Band on the (Diaper) Run." Her kids are now diaper free, but they still travel on tour with Kori and her husband. One song that Gardner said reminds her of her relationship both with her kids and her own mother is Tom Petty&apos;s "Wildflowers." A sweet sentiment for any child from their mother, Petty sings, "You belong among the wildflowers." Gardner also played an original composition, a song called "Nature and the Wreck," a song which Gardner said she wrote for her daughters. Jessica Hopper also joined us in studio for Music Thursday. She is a Chicago music critic and author of the book The Girl&apos;s Guide to Rocking. With two kids under two, Hopper certainly has her hands full, and says "Song for the Baby" by Kelis is the "mommy jam" that gets her through it. Hopper also selected a song that she likes to listen to with her kids. Elizabeth Mitchell, formerly of the band Ida, covered the Bill Withers classic "Lovely Day." A little while back Mitchell actually performed the song live at WBEZ&apos;s studios; it&apos;ll be part of our Live Music Thursday series, to be posted later today.